Veruschka is one of the polishes where I first thought "meh" when I saw swatches of it. But when I slowly began to be into greens, I was finally sold when I saw the swatches from Scrangie. I finally got my bottle from an sale at an internet forum and loved it from the moment I saw it in person. 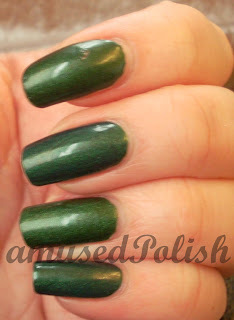 Zoya Veruschka is a green matte polish, the finish is similar to OPI's Suede polishes. I mostly topcoat my matte polishes, I prefer it( the matte finish) only as an accent nail or some kind of pattern. Anyway, Veruschka was opaque with two coats and dried incredibly fast, like most matte polishes. A few days later while I was on my way to a class I noticed a (quite big) difference on the nails where I had a silk/nail wrap (I'm sorry about the crappy picture quality, it was made while I was in the tram and didn't had a better opportunity to make a better one and I'm sorry about my pointer, I smudged it while it was drying and didn't want to repaint it). I was really suprised to see how drastic the difference can be between the nails with or without a silkwrap. Did something similar happened to you too?